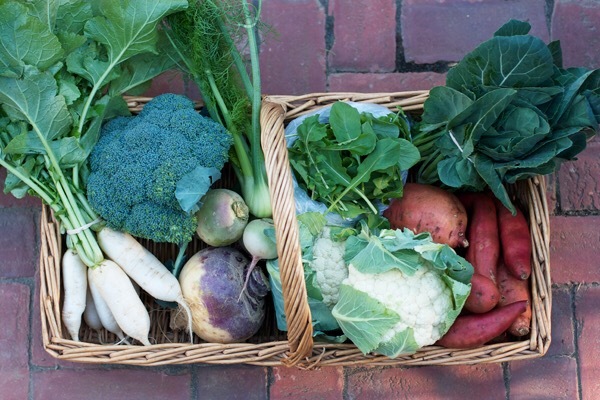 FINAL CSA DELIVERY IS TODAY! Baby Salad Greens – A green salad on the table is a must. Try one of the kale salads in our recipe section. Collards – Farmer Matt planned for these to be harvested before they got too large. They are tender and don’t need to be cooked for long. Southerners know how to cook collards- try the recipe links this week. Sweet Potatoes – In pie or roasted with honey or lemon. When in doubt, just bake ’till soft and mash them with butter and salt. Rutabaga – If you have a few more of these knocking around in the back of your fridge, you should definitely boil and mash them. They are my mother’s favorite part of Thanksgiving. She could eat half the bowl herself. I love them too! Fennel – They’re small, yes, but slice up the whole bulb and about 1″ into the stem and throw in your minestrone soup. It is delicious! Cauliflower – Roasted is my favorite way to eat cauliflower. There are a couple recipes this week you could try. Watermelon Radish – Just a few in this week’s share, but sliced and sprinkled with sea salt, they make a bright and fresh appetizer. White Turnips – Hey, add these to your appetizer platter of watermelon radish and sprinkle with salt. Yummy AND pretty AND unusual! Broccoli – I have been making lots of cream of broccoli soup for the kids. It’s their current fave! Or just steamed with butter. It’s especially sweet when harvested in the fall. Pickup on Tuesday at ALEWIFE, from 5pm – 7pm. Remember that all CSA members get a 10% discount on drinks at Alewife this one final time! Please remember to bring sturdy bags to carry your produce home.